SHREVEPORT, LA — Delicious breakfast, holiday crafts, and the traditional photo with Santa are all on the agenda at the sixth annual “Breakfast with Santa” hosted by Centenary College’s Office of Alumni & Family Relations. The family event will be held on Saturday, December 15 from 9:00 to 11:00 a.m. in Centenary’s Kilpatrick Auditorium. 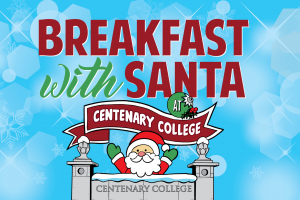 · When: Saturday, December 15, 9:00 to 11:00 a.m.
Parents, grandparents, and children from the Centenary family and the Shreveport-Bossier community are all invited to the event for breakfast (pancakes, donuts, fruit, juice, milk, coffee), holiday crafts, and a keepsake photo with Santa. Additional photos will also be available to download from the Centenary website. Reservations can be made online at centenary.edu/christmas or by contacting Saige Solomon at 318.869.5115 or ssolomon@centenary.edu. Centenary basketball fans can stay on campus following Breakfast with Santa and cheer on the Ladies and Gents as they take on regional rivals during the Shreveport-Bossier Holiday Classic at the Gold Dome. The Ladies play at 1:30 p.m. against LeTourneau and the Gents at 3:00 p.m. against ETBU. More information is available from the tournament sponsor, the Shreveport-Bossier Sports Commission. The Meadows Museum of Art is also hosting its second annual Holiday Maker’s Market from 9:00 a.m. to 1:00 p.m. on December 15. More information is available on the Meadows Museum Facebook page.